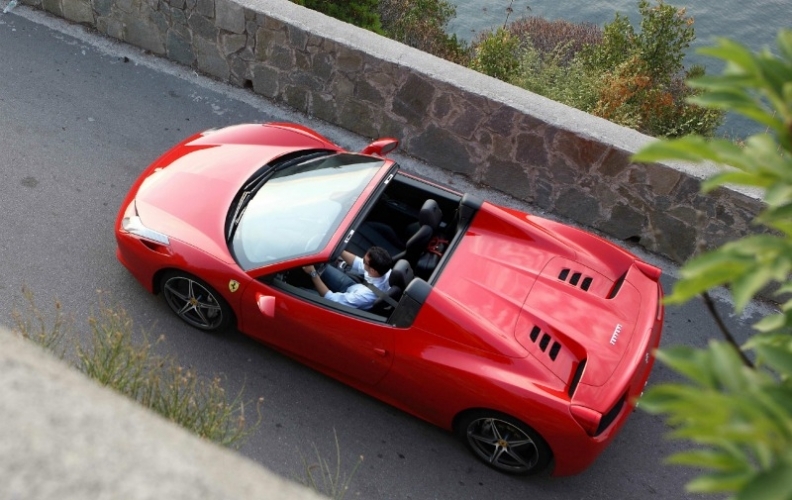 The Ferrari 458 Spider has a starting price of 226,800 euros in Italy. The Ferrari 458 Spider may be the roadster derivative of the 458 Italia coupe, but it was the design of the 458 Spider's aluminum retractable hardtop that was the actual starting point of the project to replace the F430 model line. About five years ago, Ferrari, in cooperation with its German roof supplier Webasto AG, decided that the replacement for the F430 Spider would have an aluminum retractable hardtop instead of a canvas top. Following that decision, Ferrari began working on the 458 Italia coupe, making sure that the design incorporated fins behind the seats that would later house the mechanism for the 458 Spider's roof system. The 458 Italia coupe debuted in September 2009 at the Frankfurt auto show and went on sale in February 2010. 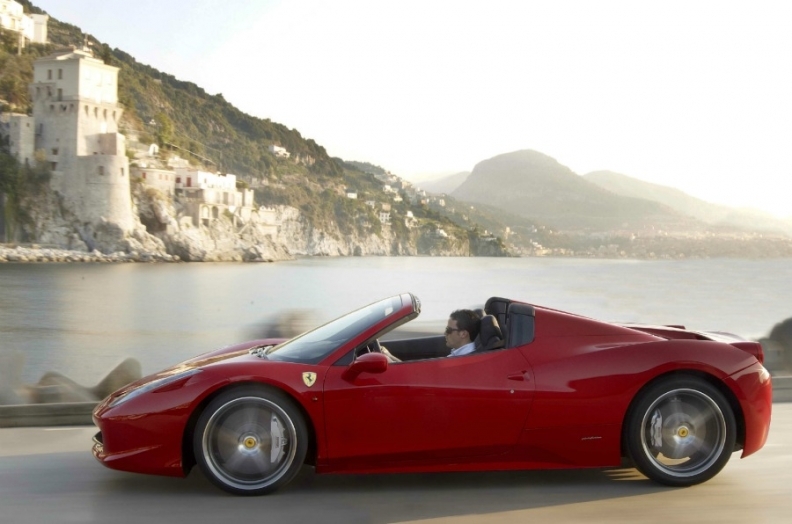 The 458 Spider debuted two years later, at last month's Frankfurt show. Ferrari's retractable hardtop is a world first for rear-engine sports car. Together with Webasto, which also sources the roof system on the California four-seat convertible, Ferrari developed a patented, fully retractable hardtop, which is a world first for rear-engine sports cars. The all-aluminum hardtop solution adopted for the 458 Spider offers a number of advantages over the traditional folding canvas top, including a 25kg (55 lbs) weight reduction and a deployment time of just 14 seconds. 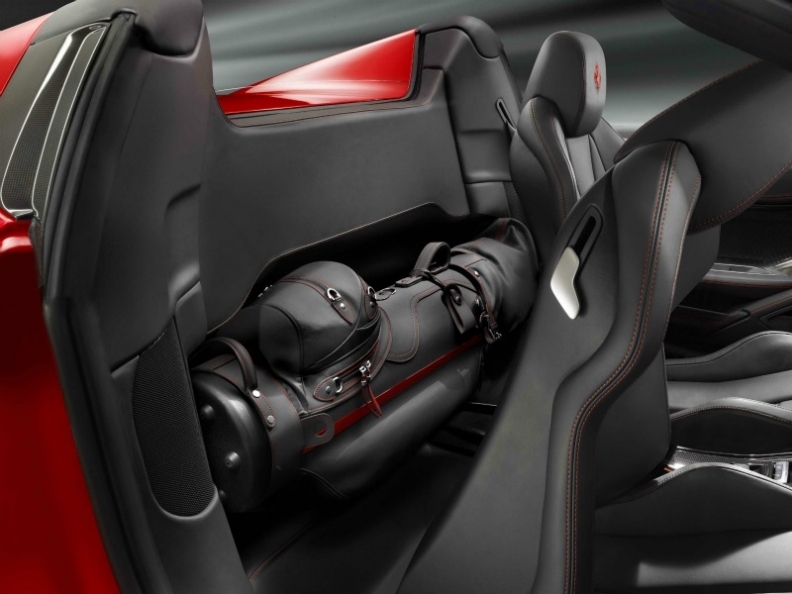 Space saved by the new roof leaves the 458 Spider with enough room for a set of golf clubs. Ferrari says the small space needed to house the roof enabled the designers to include a generous rear bench for luggage behind the seats. The space is big enough for full-sized set of golf clubs. The 458 Spider's powertrain is the same as that in the 458 Italia coupe -- a normally aspirated 4.5-liter V-8 delivering 570 hp coupled with a seven-speed dual-clutch transmission from German transmission specialist Getrag.